In the last couple of years, I’ve learned to do a relaxation exercise that involves imagining the most special place I’ve ever been. I knew without reflection which to choose: a spot beside a driftwood fire on the beach at Aurora Lagoon on Kachemak Bay. In memory the time is late on a summer evening, sunlight slanting in from an improbable angle, falling without warmth but leaving buttery light on the stalks of grass that grow up through the sand. It’s a specific recollection, selected from a deep catalog of days and nights on the bay. I don’t expect to find a more beautiful spot in this life, or spend a more contented evening than that night in magical memory. But I haven’t been back for more than five years now. I left Alaska against all expectations -- my own and nearly everybody else who knew me. Anchorage born, Muldoon reared, Alaska seasoned, I was a lifer if ever there was one. I had a great answer for folks who asked if I’d lived in Alaska all my life: “Not yet,” I always replied. But I can’t use that line any more. I rolled into Sacramento, California on Halloween in 1995 and haven’t spent a whole week back in Alaska since. Two quick personal visits -- a sick friend, and a brother graduating from UAA -- and a short business trip have been all the Alaska I’ve needed. I expect that to change, but honest appraisal forces me to admit that it hasn’t, yet. I guess I’d been gone a couple of years before I realized I had left Alaska because it broke my heart. Some people get tired of winter; I got tired of the cold-hearted attitudes that were taking over the place I loved so well. At the time I thought I left for opportunity. After more than 20 years battling the Anchorage Times, they finally quit. I knew there was still a lot of valuable newspaper work to do in Alaska, but I was 45 years old and the feeling of finishing up a chapter and turning the page was powerfully upon me. The corporate job exploring Internet publishing in California felt like a damned good chance to start writing a new one. A couple of years into my new narrative, a friend asked me to write a preface for his book of Alaska oil history. I wrote a thousand words about the state’s relationship with Big Oil and showed them to my wife. She read through quietly and said, “You know, this is awfully bitter.” I toned it down considerably -- I’ve learned over the years to trust her solid advice -- and sent the piece on to the publisher. “You know,” he told me a few weeks later, “this is awfully bitter.” I toned it down again, and still ended up with a piece that sometimes occasions comment. I didn’t realize how I felt until I wrote that. I can’t find my original draft -- Awfully Bitter No. 1 -- but I remember the overwhelming emotion was of loss and mourning. Somewhere between Swanson River and Bligh Reef, the pioneers who settled Alaska became colonists. The homesteaders became company men, the prospect of a paycheck and a PFD replacing the self sufficiency and community spirit that knitted earlier generations together through so many long dark winters. 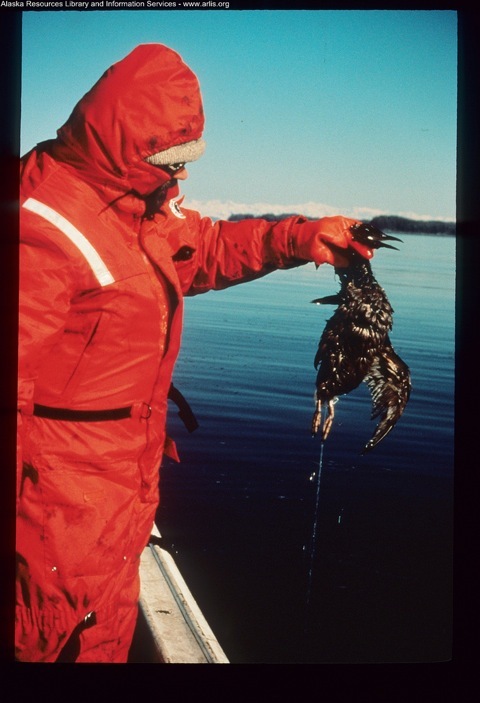 Though there was a brief rebellion after the Exxon Valdez oil spill, a few months later Alaska’s body politic rolled over again and renewed its bargain with the industry: take what you want; leave money. I don’t blame the big oil companies for acting like big oil companies; they sometimes make me mad, but I expect no better of them. My aching disappointment came from watching Alaska’s character change so profoundly. Over decades in the writing game in Alaska, I suppose I encountered every one of the 6,743 cliches available to describe the place, and none was truer than this: the real Alaska isn’t so much a state as a state of mind. Therein my problem; while the landscape and the scenery have survived reasonably well over the past 30 years, the collective “state of mind” has deteriorated faster than a spawned-out humpy in fresh water. Alaskans who used to be routinely generous and optimistic have become selfish. Oh not everybody, of course not; and not *you*, gentle reader. But far too many of your neighbors. In a society with no income tax, no sales tax and a $2,000 payment from the state for every man, woman and child, they’re pushing a tax cap. Public services and public facilities inexorably starve to death; bright new landmarks like the PAC already look worn around the edges, and public dollars to fund assistance for the less fortunate have been unapologetically eroded, as well. The growing selfishness is particularly virulent when it comes to relations between the new majority culture and Alaska Natives -- never more evident than in the endless, ugly debates over subsistence hunting and fishing. Yeah, sure, some guy in a Wasilla four-plex has just as much claim on the fish and game as a family on a roadless stretch of the Yukon whose culture has revolved around hunting for 5,000 years. Think Native suicides and alcoholism might be connected to missionaries and the cash economy? “Hey, *I* never did anything to ’em,” he might reply. Alaskans’ unwillingness to recognize the unique needs and rights of Native people amount to the continuing rejection of a rare opportunity to blend dominant and indigenous cultures in ways that could have strengthened both. Instead, unconditional surrender is demanded, engulfment uber alles. Hand-in-hand comes the steady deterioration of the authentic in Alaska. Yes, February is still dark and sometimes chilly, but there’s often little else to distinguish Anchorage from Akron, strip mall alongside franchise next to themed restaurant. Far too little of Alaska’s art or music springs from Northern soil; it is far more likely to be derivative, a country-cousin copy of something being done Outside. The tourist trade is most often an entirely packaged experience these days, industrial recreation delivered aboard self-contained floating cities. Alaska is no worse than many places in such matters -- but I never expected much of the other places. Alaska was supposed to be special; my affection flagged as I discovered the many ways in which it is not. California’s legislature can be as cynical and venal as Alaska’s (though seldom as boneheaded), but it doesn’t pain me nearly so much to watch them screw up here. I like my new life here and living in California just fine, thank you -- but I truly love Alaska. As a journalist, I still sometimes miss the security of working in my hometown, of knowing the political landscape as intimately as the natural scenery, of feeling surefooted while navigating the community. About seven months after leaving, a friend wrote with lots of detailed, inside news about the Alaska legislature. Reading his letter and understanding all the nuances, I realized, with some sadness, that I would never again in this life understand anything as fundamentally as I had understood Alaska. The realization came with a distinctly bittersweet twinge. Aboard the MV Columbia, well away on our journey out of Alaska, a woman came across the aisle in the snack bar and stopped at our table. “You don’t know me, but I wanted to tell you that we’re going to miss you in Anchorage,” she said. I’d heard that a few times before departing; the people who were glad to see me go mainly had the good grace not to say so to my face. I smiled and told her I knew I was going to miss Alaska, too. My wife Barbara first noticed the woman’s husband—a trim 70-year old with a neat white goatee and a Levi jacket: Keith Miller, third governor of Alaska, enroute back to their winter home in Florence, Oregon after a summer in Girdwood. “You’ll be back,” he told us. 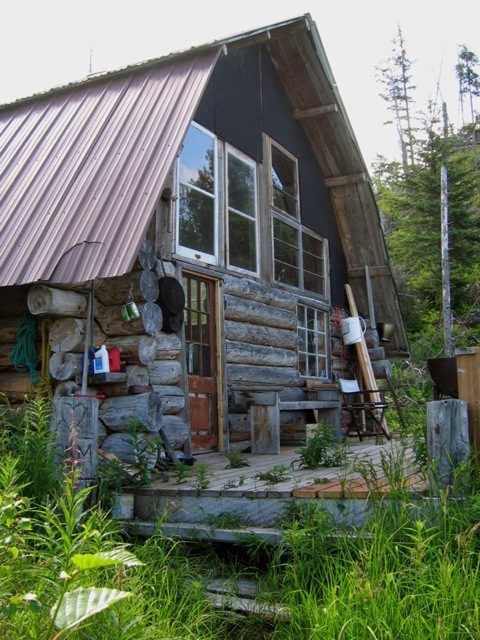 Frank Mullen and I met in a smokey barroom in Juneau in 1973 but our friendship blossomed in the open air of Cook Inlet and Kachemak Bay, where he let me fish a gillnetter with him and also help build this cabin near Bear Cove. 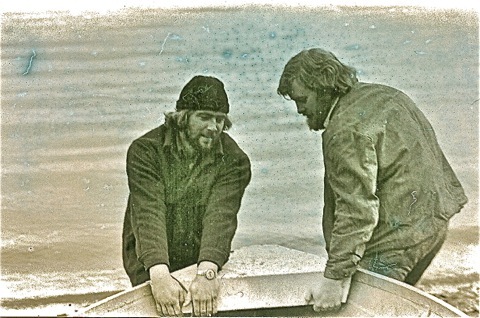 He introduced me to much of what is best about Alaska, and the “most special place I’ve ever been” mentioned in the story here is just down the beach from the cabin.